Let me check the time. Just as I thought, it’s time for another Stone Quote. 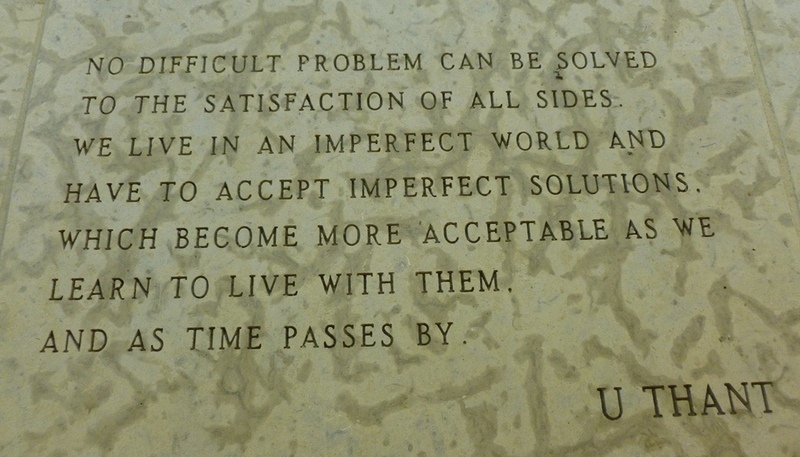 One of the quotes carved into limestone at the International Peace Garden, near Dunseith, N.D.
Another great quote that is applicable not only to world peace but to how we deal with everyday life. Here’s a nice article about U Thant from the Encyclopedia Britannica, for those of you who are drawing a blank on his name. And here’s a link to information about the International Peace Garden. The 2,339 acre botanical garden is not only lovely, it is dedicated to world peace. Remember, we are raising the money to do more work on the Stone Bank, and we could use your help. Use the PayPal link to send us some love.